Women are generally very artistic, they have an artistic touch in everything they do. Be it cooking to cleaning they think very creatively and take things in the same way. 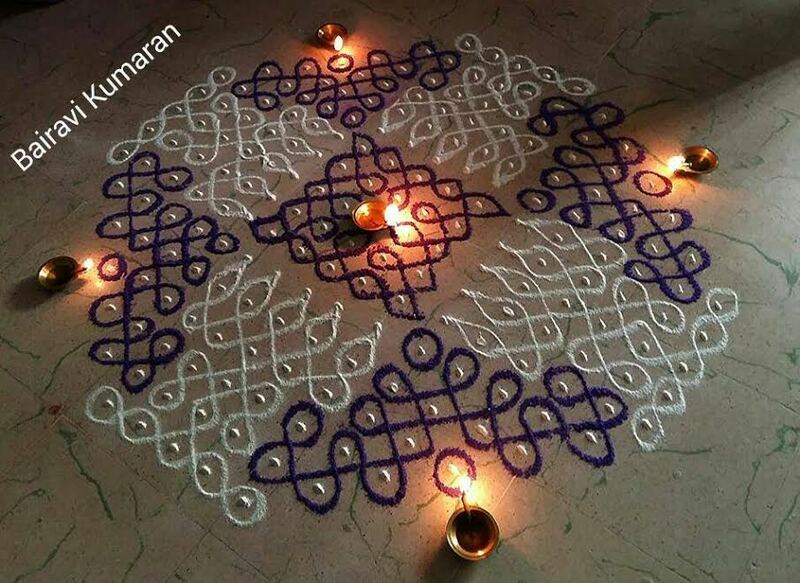 Kolam is one of the art loved by women. Kolams are usually put in front of the house or pooja room as the tradition believe that it brings goddess Lakshmi brings home wealth and prosperity. They also feel that it is good to feed the ants in the streets as the kolam is drawn using the rice flour.People in ancient days wake up early morning and spread the area with the water mixed with cow dung and clean that area. Then the kolam is drawn using the hands. 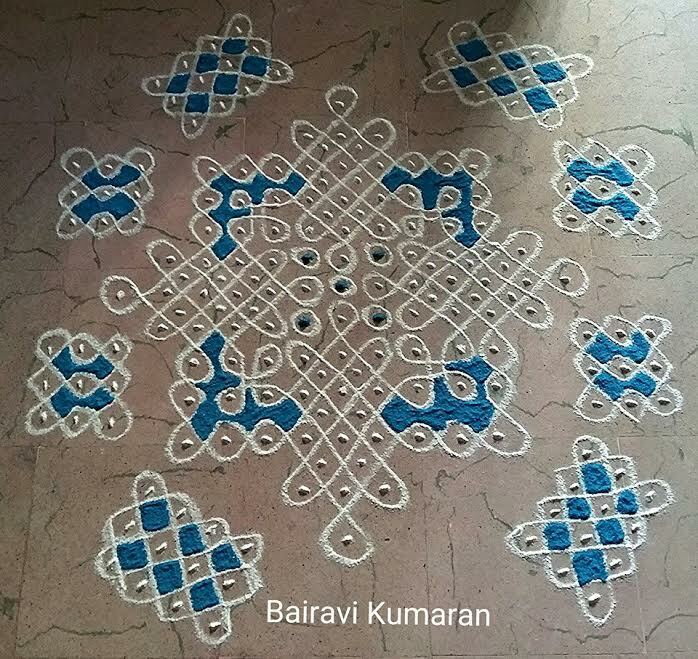 They use rice flour or the white stone powder to draw the kolam. They aso give beautiful colors to the kolam that are available in the market. Kolam can be of many types, in north India it is called rangoli which is drawn using free hand, in south India especially in Tamilnadu and Andhra they draw it using dots or parallel lines. The kerala people decorate it with real flowers which looks extraordinarily beautiful. The tamil nadu people mostly draw the kolam with dots and the lines connect the kolam forming a design, they are popularliy called as pulli kolam. 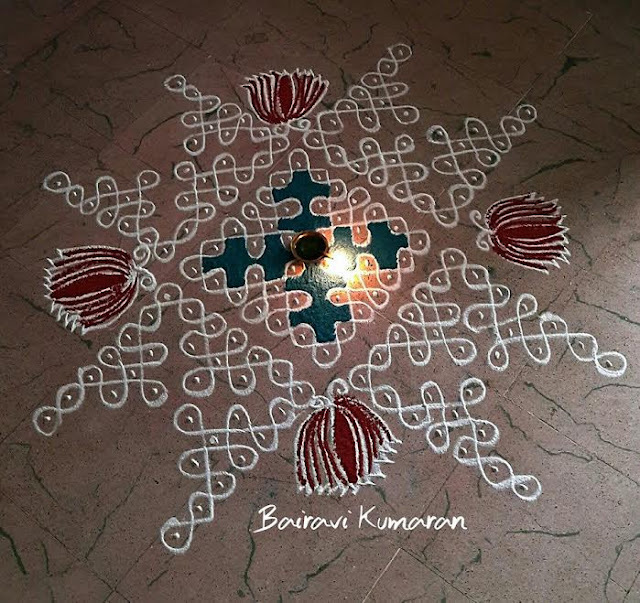 The size of the kolam depends upon the number of dots you keep and the pattern of the kolam. There is another type of dotted kolam where the dots have curved lines and joints surrounding them. This is called as sikku kolam. Sikku kolam is also a form of rangoli but has a unique speciality in it. 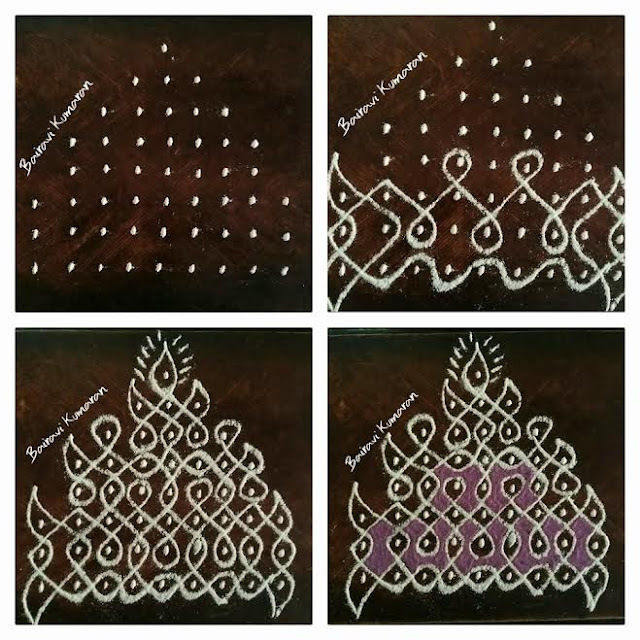 They form a grid technique that the other person cannot determine the start point or end point of the kolam. People usually say that the one who is expert in drawing sikku kolam will also have the ability to solve the problems easiliy, because the name of the kolam itself is “sikku kolam” where “sikku” in tamil means “problem”. 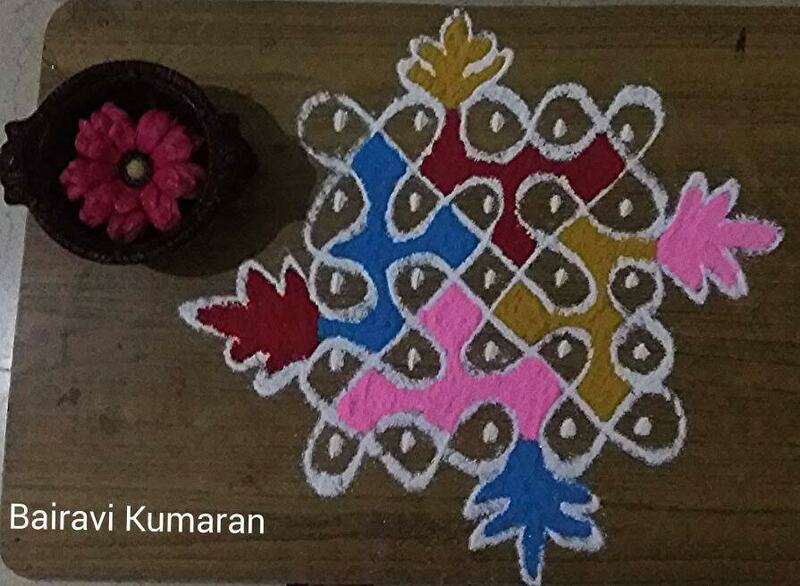 Sikku kolam designs are very difficult and needs a lot of practice. You can start with the easy small designs and then go to the bigger ones as you earn proficiency. There are lots of books available in the market that will help you with the design and the method of drawing them. You can first practice them on papers once or twice and then go live. 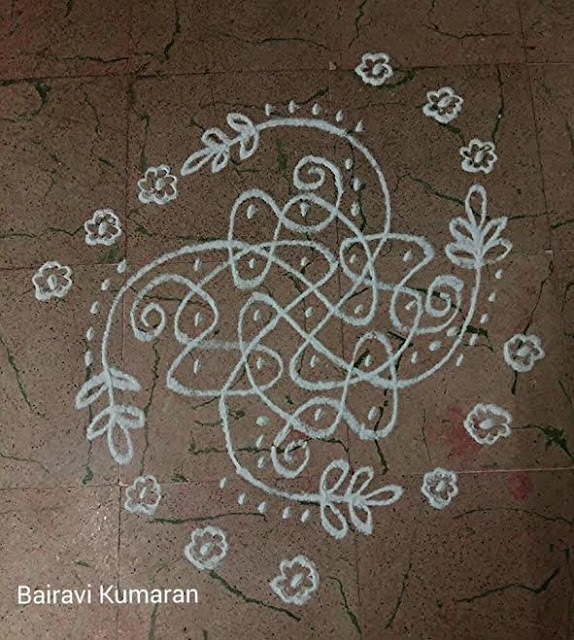 This is how this sikku kolam design starts, you can see the picture of keeping the dots first and then starting the kolam. This siku kolam form a triangle shape at the end and filled with beautiful purple color at the center of this sikku kolam designs. The top of the triangle is given a lamp design. This sikku kolam design is one of the unique pattern forming the shape of a hexagon, you can see that the center is started with a hexagon and the finishing outline is also of the hexagon pattern. They have given the kaavi color outline made of brick stone powder. 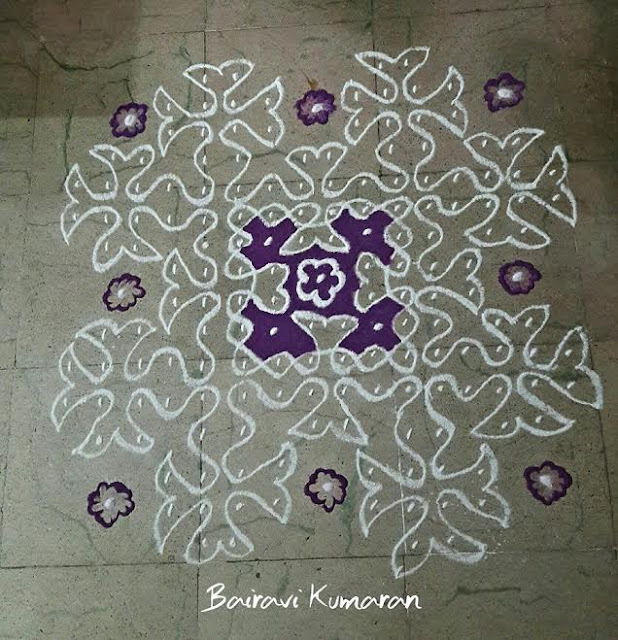 This is a very common pattern of sikku kolam forming a diamond shape but the formation of the diamond shape is very much unique. They design is crowded all over and they have filled purple color in the center and given a purple color outline too. This sikku kolam forms a beautiful array of flowers. This siku kolam pattern is quite easy when compared to the big ones and will be suitable for the beginners to practice. They have just drawn it using the rice flour to give a simple and neat look. 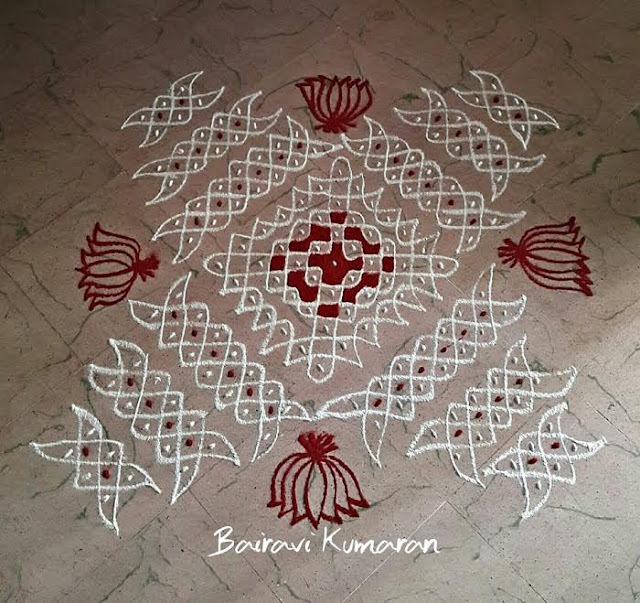 This sikku kolam design is again a hexagonal kolam design that starts with a circle and forms out the hexagonal pattern with many grid patterns in the between. They have highlighted few areas with yellow and navy blue that makes the siku kolam look brighter. This is a square pattern siku kolam designs with separate grids all over. They have highlighted certain grids of the kambi kolam with beautiful parrot green and also given the outline for it in the same color. 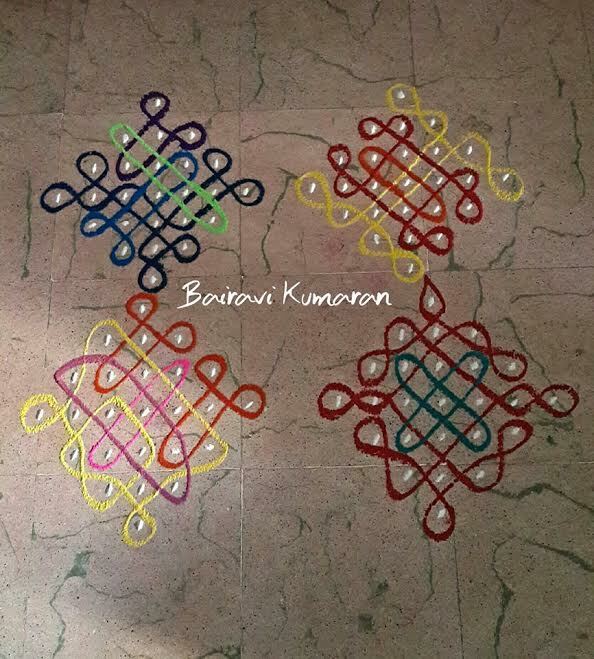 The design and the color makes the kambi kolam look extra ordinarily bright. There are so many grids forming a square shape in this design all these grid square connect to form a castle at all the four sides. The pattern is given bright red and yellow color as outline and they have filled the center with red color. 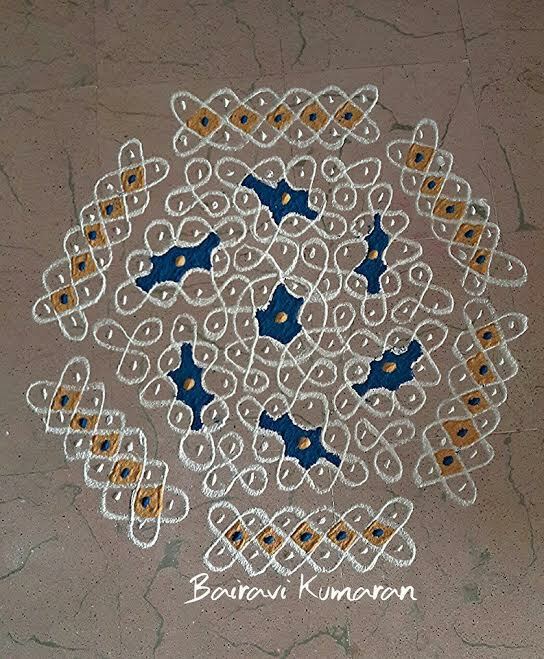 This colorful rangoli forms a square with bright colors flilled at the centers to give a creative look, each side of the kolam ends with a flower and they are given color correlating the colors at the center. The colors they have chosen gives a very bright look. This is one more simple design for the beginners with easy to follow grids. They give a beautiful rangoli pattern and highlighted with the turmeric yellow color and bright white outline. This unique sikku kolam has a lotus design which looks a little complicated. It starts with a square grid and ends with a lotus at the sides and borders drawn in grids. They have given kaavi color for the lotus and green color at the center and a lighted lamp is kept to be extra bright. 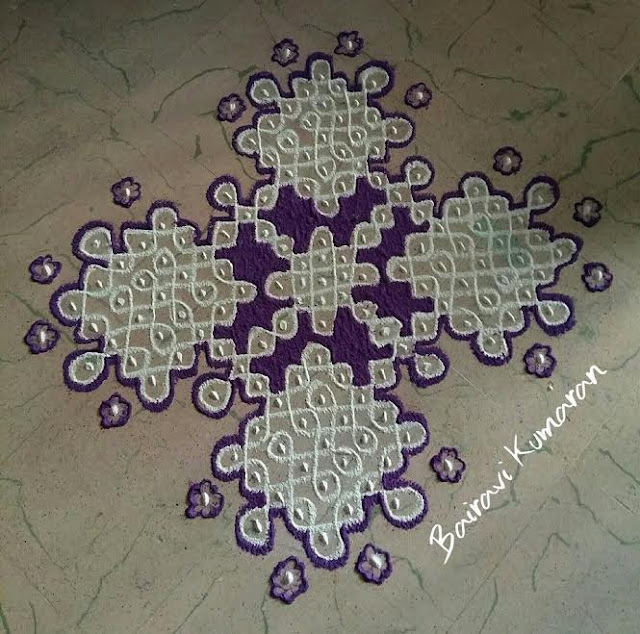 This kolam also forms a flower kind of shape and highlighted with bright purple color and small flowers in the corners. This very simple design where once design is drawn four types so that it forms a pattern, this is a must try design for the beginners. Each line in each grid is given different colors and the dots are remaining in the white color. The bright colors give a great look to the kolam. Flower sikku kolam starts with a square grid and continues to form many grids to give a different shape. 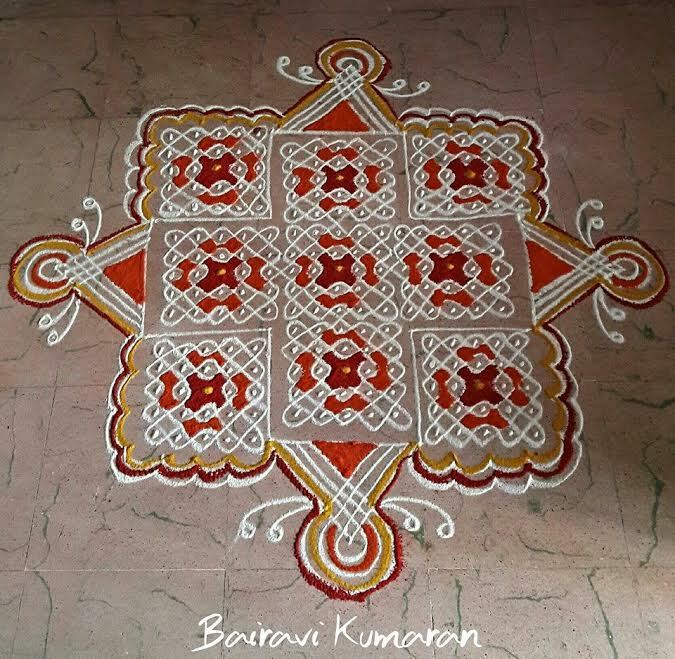 They have given different colors to the flowers and kaavi outline to the entire pattern of the kolam. This is also a simple design but looks as if it is difficult. The grids are drawn with the same pattern but of different size and different range of dots. 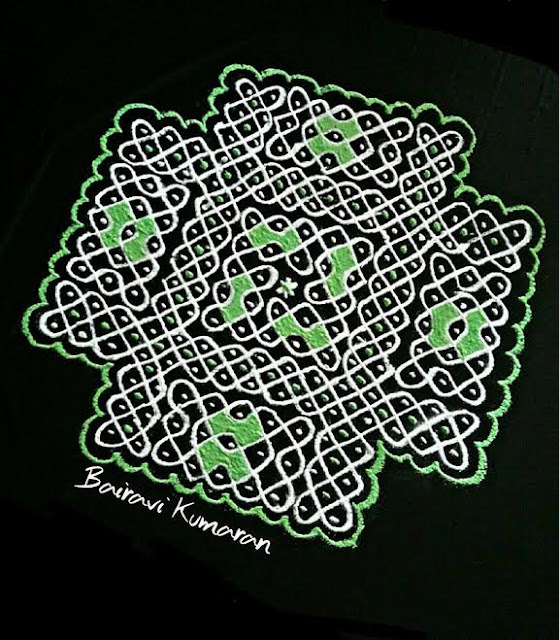 They form to give an “X” shape and the inter links are given a lotus design highlighted with kaavi brown color. This is one such complicated design forming a square where the center is filled with bright orange color. 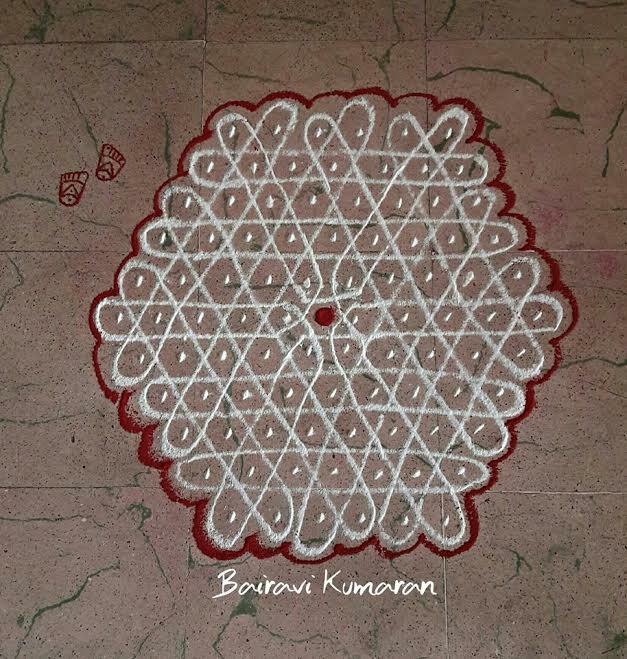 This is a common design of sikku kolam forming a diamond shape at the center and small grids are drawn on all the sides that gives a different shape to the kolam. They have highlighted the centers of each grid with blue color. 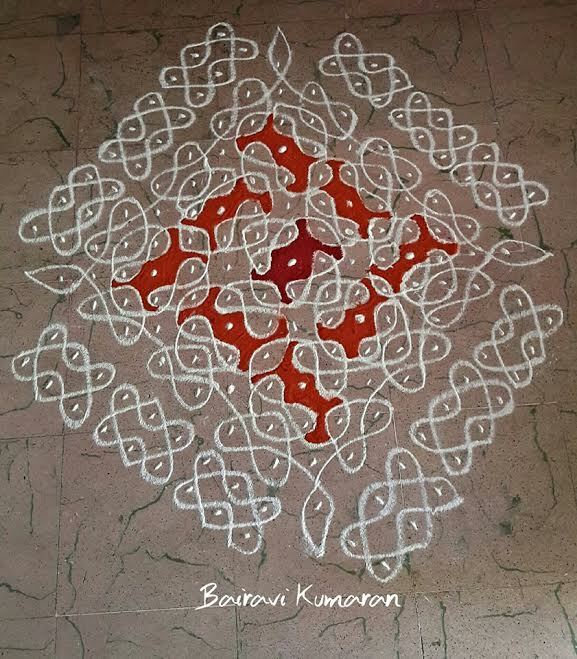 This also is one of the unique design in the sikku kolam. They have given altenate colors to each grid as one is in purple and one is in white. They have also kept lighted lamps on all the four sides to make the kolam look brighter. Lighting lamps are according to our wish, you can choose to keep lamps if it is any special occasion or festival to give a special look to the kolam. I would like to thank Mrs.Bairavi Kumaran who happily gave us permission to feature her siku kolams in our blog. 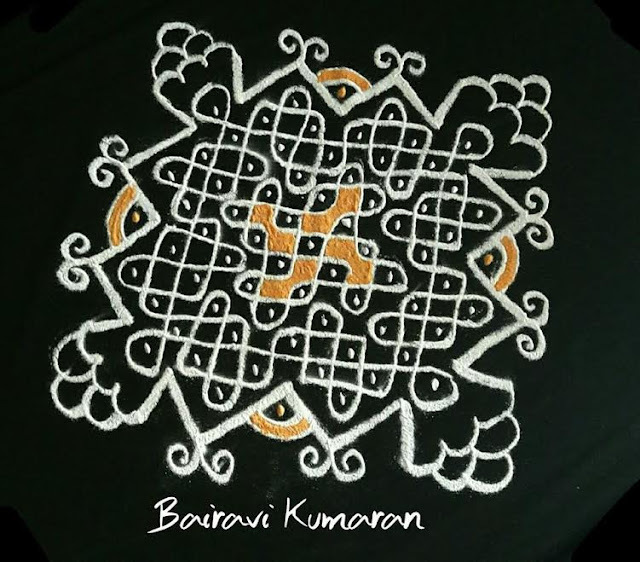 You can follow her in Facebook to get updates on her beautiful kolams. 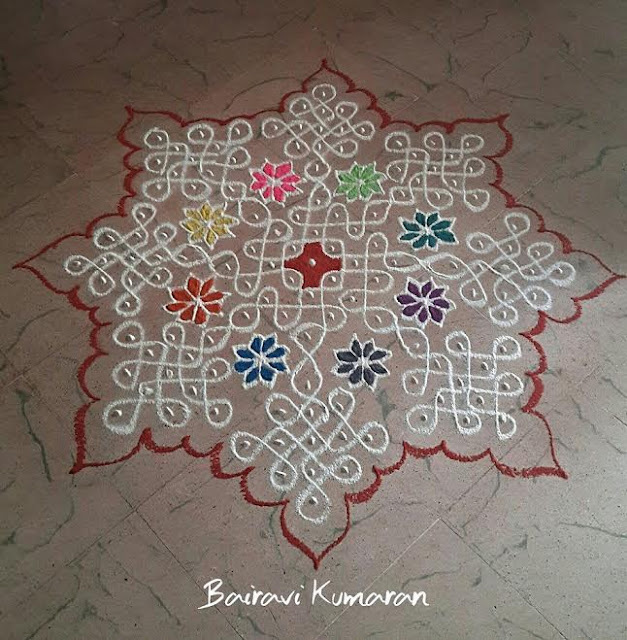 Hope this article gives you an idea about the sikku kolam patterns and how to practice them. It may be difficult at the beginning but once you start practicing and it will seem to be very easy , and as the days goes by you will become a pro.